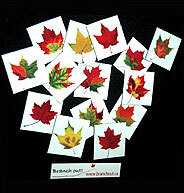 I confess that I am a compulsive collector of leaves, especially during Canada's glorious autumn season. They are simply awe-inspiring! Each leaf is unique, yet combined they create a fiery monument of strength and power that is unbeatable, just like Canada, just like Canadians. 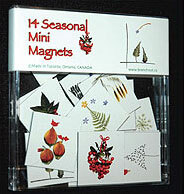 Packaged in a hard, flat jewel case, these delightful little magnets are easy to ship and make an ideal small gift for adults and children alike. In the spirit of the season, these magnets are little wishes for happy celebrations of music, food, love and laughter shared with family and friends. These are universal joys of the heart that belong to all cultures. For best results, use every season! Branch out! 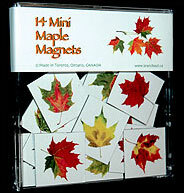 magnets are an excellent way to continually encourage and remind people of values, goals, support and other daily challenges and they are enjoyed and appreciated by all age groups. 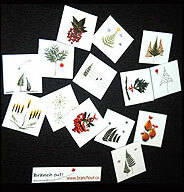 Click on any magnet to see a larger image.